Franklin Ford (1849-1918) is an enigmatic figure in the history of American journalism. After stints at the Baltimore Gazette, the Philadelphia Record, and the New York Sun, Ford made a name for himself as the editor of Bradstreet’s – A Journal of Trade, Finance, and Economy, from 1880 to 1887. 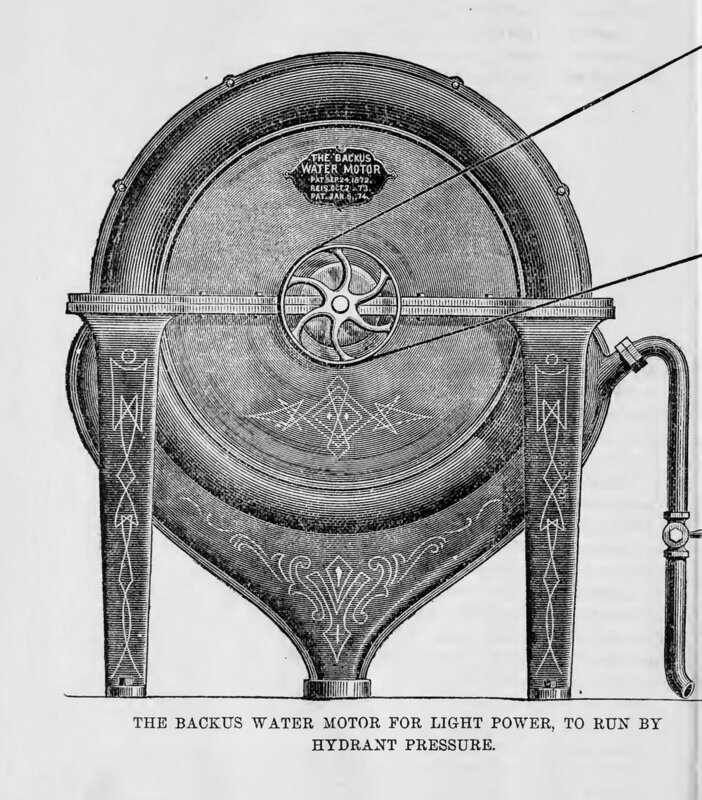 Ford’s experience as a journalist shaped his powerful, original, and somewhat poetic thinking about the “organization of intelligence” in the new age of the locomotive, the telegraph, and the telephone. Feeling that “the newspaper was off the track, caught in its own machinery,” Ford wanted to find a “nursing ground” for his new ideas about journalism. That place would be the university. 1 In 1888, he established contact with scholars from Harvard, Yale, Cornell, Columbia, Pennsylvania, and John Hopkins—with very little success. He eventually found a receptive ear in the person of John Dewey, then in his early thirties and Chair of philosophy at the University of Michigan. In this project, we propose a different approach to Franklin Ford’s work. As Dan Schiller argued, the fact that Ford got to John Dewey— their collaboration at Michigan lasted almost five years—is perhaps less a sign of young Dewey’s gullibility than of Ford’s credibility.9 When Ford met Dewey, he was a respected journalist who had published treatises on municipal reform, banking, and insurance, most of them still unknown to journalism and communication historians. Ford’s oeuvre is interesting for various reasons. His style is fascinating, tortuous and mysterious, rich in intuitions, and eminently expressive:11 “The movement of inquiry in its highest and deepest sense squares itself with the work of the newspaper, simply because the business of the newspaper has come to be inquiry.”12 In today’s academia, who would dare write such prose? Ford is also an important and forgotten figure of the intellectual history of journalism, whose ideas were taken up by many people. He had a significant influence over Robert Park, whose classic The Natural History of the Newspaper is indebted to Ford’s ideas concerning the “natural history” of governments and of news reporting.13 Dewey’s canonical work, The Public and Its Problems (1927), clearly echoes Ford’s faith in technology and journalism as tools for democratic inquiry.14 More important, Ford’s work, in many respects, speaks to our modern-day problems. The highly centralized news system envisioned by Ford, which was to be connected to a widespread communication network, is not unlike our contemporary news system dominated by Google and Facebook. 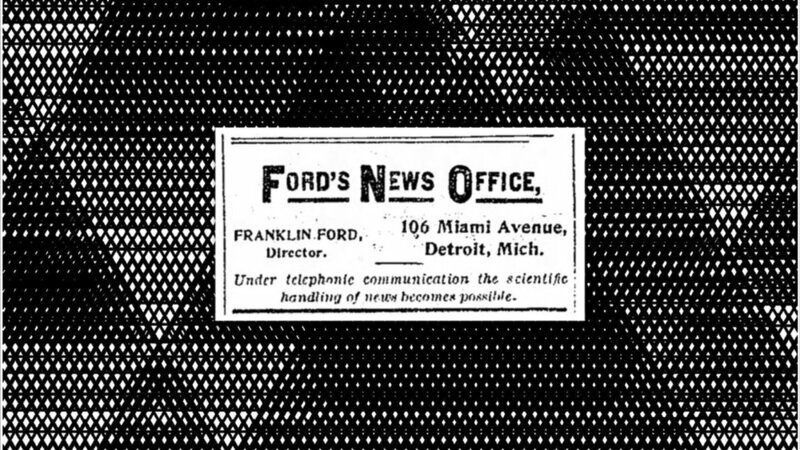 Computer-assisted reporting, data journalism, and polls are daily tributes to the scientific reporting Ford valued. Franklin Ford, The Industrial Interest of Newark, (N.J., New York: Van Arsdale & Co, 1874). Speaking of its (unclear) genealogy, "conversational" journalism is an idea with unexpected turns. It was at the heart of public journalism in the 1990s, when it was seen as a guiding principle for journalists as they intervened in public life. Today, its most recent avatar is #ConvJournalism, a hashtag that gathers the chatbot enthusiasts who think that “botification” is the future of the news. Encouraged by the reception of smart digital-savvy outlets such as Quartz— applauded as a hero of conversational journalism for the launch of its mobile, emoji-loaded, let's-text-about-the-news app—major news organizations recently developed a flurry of conversation bots that are supposed to deliver the news to the public in that ubiquitous, laid-back chat tone. Here, the focus is on technology, on personalization and automation, on “user engagement” and on reaching new audiences. Just another marketing trend springing from the same good old technological determinism that always finds new technologies to "save" journalism, then? Hints of democratic inquiry into, and participation in, public life nevertheless sometimes pop up, as an evaporated souvenir of public journalism's struggle, and, to us, a far-reaching, faded ripple of Ford's vision. Chatbots, even if their creators don't sell them that way, may take part in an effort to reimagine the news media not as a neutral belt-drive that conveys data, but as devices to realize and (re)produce the social organism. Of course, this is a somewhat artificial pasting of contemporary problems onto Ford's proposals that speak very specifically to the context and concerns of his time. The fascinating thing about Ford is that he seems to have predicted everything. We could easily make him the father of all future-of-news pundits. This is also due to his peculiar style, full of bold claims and never afraid of bravado, which also comes with its lot of vagueness and contradictions. If Ford's style is fascinating, reading his prose can be an overwhelming experience. Diving into the Draft of Action during our first exploration of Ford's work, we found ourselves spellbound. His style is all pomp and extravagance, then suddenly becomes quick-fire and telegraphic, all at a dizzying pace. Everything made sense, but nothing really did. That feeling only grew when we started to explore Ford's other works. It all seemed so obvious, everything was so immediately quotable, but did we understand anything? We needed to find a way to break the spell and to distance ourselves from the infectious charm of his writing. Hence the Twitter bot, which is an experiment in distant reading.21 Here, it is not the scale of data that demands the assistance of machines to find new entry points into the text —Ford's complete works is not exactly big data—but its nature that requires a refreshed gaze. This distant reading would not make any sense in and of itself. It requires one to "move from distant reading to interpretative detail and then back to distant reading. "22 The tweets act as heuristic elements of surprise in our inquiry, nagging us randomly with parts of Ford's thinking that had eluded our attention, driving some points home, or offering transversal pathways into the material. Besides, it has not escaped our notice that developing a bot that tweets the musings of a late nineteenth, early twentieth century future-of-news guru is a not-so-subtle wink to the current #ConvJournalism trend. Finally, this project also constitutes an attempt to explore the complex relationship between “old” and “new” media. As Zielinski suggested, the idea is not so much to search for the “old” in the “new” but to find something “new” in the “old.”23 In this sense, “old” media and “old” media theory are “reservoirs, toolboxes for design and thought.”24 Our interest in Ford and Thought News is not only and not primarily antiquarian. It is as starting points for experimentations and theoretical developments that they are most useful. Ford’s Draft of Action is not only about the future of journalism, but about the relationship and interpenetration of media—money, trains, telephones, telegraphs, and newspapers—and the profound epistemological and aesthetical transformations associated with them. Ford identifies a crucial tipping point in media history—what Zielinski will later call “cuts” or “windows”—and proposes a “new” way to think about media and the news. His basic idea may seem obvious today: media matters. 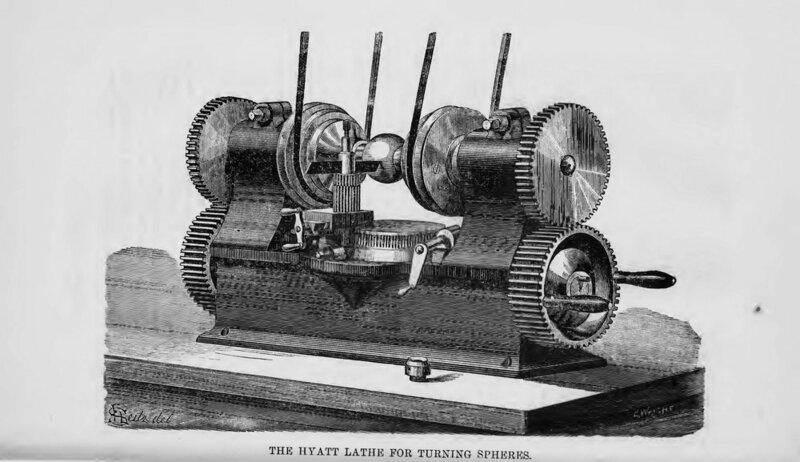 Through high-speed transmission technologies and with the newspaper acting as a “record,” the nature and effects of “facts” profoundly changes, as they are brought “alive.” His hyperbolic prose reflects the scale of that change. Franklin Ford is a media theorist. How this project materialized is also a tribute to Ford's ideas, applied to historical inquiry. If the "movement of intelligence" is achieved when facts are precisely recorded, put in motion, and circulated through the social organism, then this is a modest contribution that seeks to huddle together specific kinds of "facts" (Ford's writing as well as any archival material related to Ford's life), stir them with automated and close reading, and disseminate them across the social body with high-speed transmission technologies (Twitter, and this website). Through the precise recording of the archives/facts and their electronic treatment and circulation, we try to socialize the historical material and to revive Ford. @franklifordbot is a remediation of Franklin Ford. Trying to triangulate Franklin Ford, we have squared him. Our "bot" is a couple of simple Python scripts. It feeds on textual data, the collection of which required a fair amount of legwork: we have patiently gathered what we could find of Ford's written production, thanks to the magic of inter-library loan; and digitized it with the help of high-tech marvels such as dusty microfilm scanners and smartphone OCR apps. A first script parses that textual data into sentences that are subsequently filtered according to a list of keywords (which is indebted to our close reading of the texts). Going from distant to close reading, we then proceed to read all those sentences and edit them slightly for readability and to make sure that they fit with Twitter 140-character format. A second script then tweets the selected sentences, at random intervals, geolocated with the pieces of information we could assemble from Ford's biography (for instance, excerpts from his correspondence with Holmes are tagged with the GPS coordinates of Columbia university; snippets from the Draft of Action, with that of the University of Michigan campus at Ann Arbor). Juliette De Maeyer & Dominique Trudel, Montreal, April 2, 2017. Franklin Ford, Draft of Action (Ann Arbor, 1892), 3. Other people involved or solicited included journalist and scholar Joseph Villiers Denney and Edward C. Hegeler, publisher of The Monist. John Dewey to E. C. Hegeler, November 20, 1890 and January 12, 1891. John Dewey to J. Villiers Denney, February 8, 1892. “The Thought News,” The University of Michigan Daily, April 8, 1892. See Robert B. Westbrook, John Dewey and American Democracy (Ithaca: Cornell University Press, 1993), 51-58. John Dewey to Willinda Savage, May 30, 1949. James Carey alternatively suggested that the first issue had been printed and that Thought News failed because it lacked the necessary funding. See James W. Carey, James Carey – A Critical Reader (Minneapolis: University of Minnesota Press, 1997), 25-26. In addition to those already mentioned, other works about Thought News include Daniel Czitrom, Media and the American Mind: From Morse to McLuhan (Chapel Hill: University of North Carolina Press, 1982), 104-121; Fred. H. Matthews, Quest for an American Sociology. R. E. Park and the Chicago School (Montreal: McGill University Press, 1977), 20-30; Neil Coughlan, Young John Dewey (Chicago: University of Chicago Press, 1976), 100-109; Jonathan Auerbach, Weapons of Democracy: Propaganda, Progressivism, and American Public Opinion (Baltimore: John Hopkins University Press, 2015), 8-15; David H. Burton, “The Curious Correspondence of Justice Oliver Wendell Holmes and Franklin Ford,” The New England Quarterly, 53, no. 2 (1980): 196-211; Willinda Savage, “John Dewey and Thought News at the University of Michigan,” Michigan Alumni Review 56 (1950): 204-207. Zena Beth McGlashan, “The Professor and the Prophet: John Dewey and Franklin Ford, ” Journalism History 6, no. 4 (1979): 109. Dan Schiller, Theorizing Communication: A History (New York: Oxford University Press, 1996), 25. On Ford’s correspondence, see D. Burton (Ed. ), Progressive Masks. Letters of Oliver Wendell Holmes, Jr., and Franklin Ford, Newark, University of Delaware Press, 1982. For an analysis of Thought News as an attempt to revolutionize writing, see Jeremiah Dyehouse, “Theory in the Archives: Fred Newton Scott and John Dewey on Writing the Social Organism,” College English, 76, no. 3 (2014): 248-268. Ford, Draft of Action, 39. James W. Carey and Norman Sims, “The Telegraph and the News Report” (presentation at the annual meeting of the Association for Education in Journalism, College Park, MD, August 1976). Zena Beth McGlashan, “John Dewey and News,” Journal of Communication Inquiry 2, no. 1 (1976): 3-14; Andrej Pinter, “Thought News: A Quest for Democratic Communication,” Javnost – The Public 10, no. 2 (2003): 93-104; John Durham Peters, “Satan and Savior: Mass Communication in Progressive Thought,” Critical Studies in Mass Communication 6 (1989): 247-263. Jay Rosen, “We’ll Have that Conversation: Journalism and Democracy in the Thought of James W. Carey,” in James Carey – A Critical Reader, ed. Eve Stryker Munson and Catherine A. Warren (Minneapolis: University of Minnesota Press, 1997), 191. Ford, Draft of Action, 12. Carey curiously suggested that his ideas on journalism as conversation derive from thoughts he had when facing a Polish memorial gravestones for Solidarity (Solidarność): “I was thinking of Solidarity when I said in my paper that we should “think of journalism as a record, a conversation, and an exercise in poetry and utopian politics.” James W. Carey, “The Press and the Public Discourse,” The Center Magazine 20, no. 2 (1987): 19. On Carey’s underuse of quotation marks and ability to creatively recast the intellectual history of communication and journalism, see Jefferson D. Pooley, James W. Carey and Communication Research: Reputation at the University’s Margins (New York: Peter Lang, 2016), 149. Carey, James Carey – A Critical Reader, 217-218. In similar fashion, Carey writes “the printing press, television, the Internet—do not so much create communities as remind us of our communities elsewhere embodied in the first-order ritual and conversation.” Carey, James Carey – A Critical Reader, 314-315. Richard R. John and Jonathan Silberstein-Loeb, Making News: The Political Economy of Journalism in Britain and America from the Glorious Revolution to the Internet (Oxford: Oxford University Press, 2015), 243. Ford, Draft of Action, 8. Franco Moretti, Distant Reading (London and New York: Verso Books, 2013). Geoffroy Rockwell and Stéfan Sinclair, Hermeneutica: Computer-Assisted Interpretation in the Humanities (Cambridge: MIT Press, 2016), 117. Siegfried Zielinski, Deep Time of the Media (Cambridge: MIT Press, 2006), 3. Jussi Parikka, What is Media Archaeology? (Cambridge: Polity, 2012), 20.